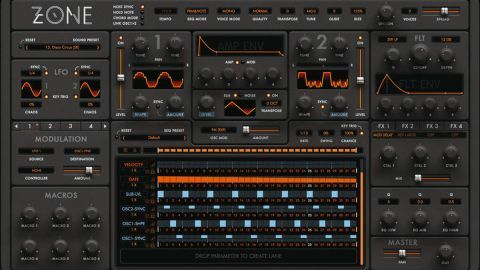 A few minor niggles aside, Zone is an immensely powerful synth crammed with sound-design and sequencing features. Sequencer and macro mod depths can’t be adjusted. Macro knobs can’t be renamed. Only one modulator per sequencer lane. Available as either a one-off purchase or via Splice’s rent-to-own model, Zone is the first product - a “parameter sequencer synthesiser”, no less - from Audiaire, a new software company founded by Sample Magic head honcho Sharooz Raoofi. Zone’s scalable, single-window interface is as easy to navigate as it is aesthetically pleasing. Sound generation starts with the two identical oscillators, each of which can be loaded with one of 151 single-cycle waveforms, all sampled from vintage synths and ranging from analogue waves through to more modern, esoteric shapes. And, yes, you can also import and load your own single-cycle waveforms. Sub oscillator, switchable between one of five waveforms (Sine, Triangle, Saw, Square and Pulse) and tunable either one or two octaves below oscillator 1. There’s a Noise oscillator, featuring nine available shapes, and a dampening Density control. For thickening and detuning effects, up to seven true Unison voices can be dialled in, detuned and spread apart for stereo width. No modern softsynth is complete without a quality filter, and Zone’s powerful multimode resonant option comes well equipped. 12 types are available, ranging from more functional State-Variable (low-pass, high-pass, bandpass and notch), Sallen-Key (low- and high-pass) and Ladder topologies, through to more flamboyant Comb, Phaser and Circuit-Bent models. Slope can be set between 12dB and 48dB/oct, and as well as the expected Cutoff and Q (resonance) controls, a four-stage ADSR filter envelope sits directly underneath, with mod amount governed by the Depth knob. Speaking of modulation, the top-centre envelope section is where you toggle between another pair of four-stage ADSR envelopes (one hardwired to Amp, the other assignable), while the synth’s two identical LFOs boast 12 wave shapes. There are also six Macro controls for controlling one or more parameters, but annoyingly, these can’t be renamed, and mod depth can’t be adjusted at all. Mod envelope and LFO modulation is assigned via the eight-slot Mod Matrix’s menus: choose a Source (one of nine), Destination (19 are available) and MIDI CC number, then apply depth with the Amount slider. This process works well enough, but it’s a shame you can’t hook up envelope or LFO modulation via drag- and-drop like you can with the Sequencer and Macros - an odd omission. Coded by Sinevibes DSP guru Artemiy Pavlov, Zone’s 22 FX modules serve up signal processing of the highest calibre. Upon loading an effect into one of the four available FX slots, its parameters populate the knobs. Every effect utilises a dry/wet Mix slider for signal balancing, and effects parameters can be sequenced independently - see Stepping out. The majority of modules tackle virtual ambience and modulation duties, ranging from several delay types (Stereo, Ping-Pong, Ball Up/ Down, a modulated delay and the spacetastic Rain Drop) through to a Chorus, Flanger, Phaser, a trio of Reverb options and five Phaser flavours. There’s also a one-knob Stereo Width effect, while a Distortion, Decimator and Compressor bring the crunch and punch. The true star of the Zone show is the 32-step Sequencer Grid. Almost every one of Zone’s controls can have its own independent Lane (alas, only one parameter per lane), created and assigned via drag and drop. An unlimited number of lanes can be created, each with its own independent loop range for polyrhythmic action. First, deploy either Parameters, Note data (semitone-locked Pitch, Velocity and Gate), or both for sequencing; sync to host, or set an unsynced tempo value; and customise playback with controls for Rate division (128th-note to 8 bars), Swing and Chance, the latter setting the probability of a step playing. Steps can be deactivated or randomised, and step range can be looped globally, too. Editing a sequence is, mostly, fun and intuitive. Click the columns to set step values, or right-click and drag to draw linear fades. One of 100 preset patterns can be loaded for each Lane. Alongside each Lane is a set of tools for expanding the editing view, and locking/clearing/muting/deleting lane data. The Options menu also handles parameter assignment, lane-to-lane copy/paste, value flip/nudge, and value scaling. Frustratingly, the latter is the only way to scale mod amounts - there’s no ‘mod depth’ control on hand. After the FX comes a three-band, fixed- frequency EQ (a 250Hz low shelf, 750Hz bell/ peak filter and 4kHz high shelf), each band featuring +/-10dB cut/boost and Q controls. This EQ can be placed before or after the FX section in the signal path. Finally, the Master section houses a final Pan slider and Output level knob. Despite our mod-assignment gripes, Zone admirably holds its own as a newcomer in the somewhat crowded virtual instrument arena. Its slick interface and powerful oscillators encourage sound generation of the virtual analogue kind, while those timbre-twisting osc-mod options, wave-bending capabilities and flavoursome filter types can easily pull your sounds down a more modern, digital path. However, it’s in the ambitious approach to sequencing that Zone truly shines, greatly simplifying the creation of blissful arpeggios, spiky percussive grooves, bubbling basslines and animated rhythmic noises of all kinds.